Proposition 65 requires the provision of a warning to California consumers regarding products containing certain chemicals. 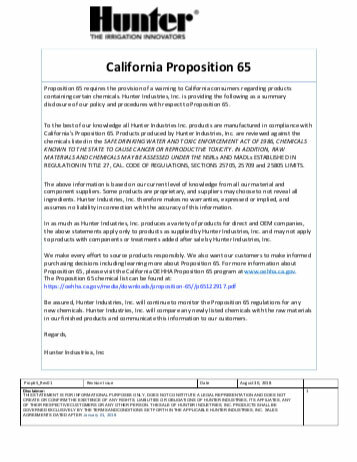 Hunter Industries, Inc. is providing the following as a summary disclosure of our policy and procedures with respect to Proposition 65. To the best of our knowledge all Hunter Industries Inc. products are manufactured in compliance with California's Proposition 65. Products produced by Hunter Industries, Inc. are reviewed against the chemicals listed in the SAFE DRINKING WATER AND TOXIC ENFORCEMENT ACT OF 1986, CHEMICALS KNOWN TO THE STATE TO CAUSE CANCER OR REPRODUCTIVE TOXICITY. IN ADDITION, RAW MATERIALS AND CHEMICALS MAY BE ASSESSED UNDER THE NSRLs AND MADLs ESTABLISHED IN REGULATION IN TITLE 27, CAL. CODE OF REGULATIONS, SECTIONS 25705, 25709 and 25805 LIMITS. The above information is based on our current level of knowledge from all our material and component suppliers. Some products are proprietary, and suppliers may choose to not reveal all ingredients. 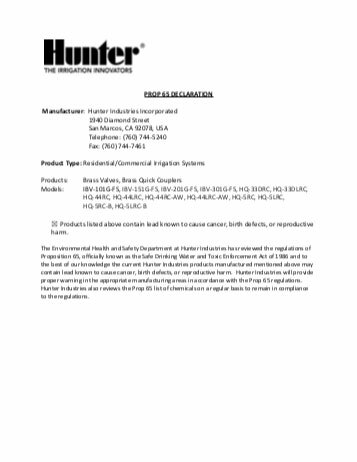 Hunter Industries, Inc. therefore makes no warranties, expressed or implied, and assumes no liability in connection with the accuracy of this information. In as much as Hunter Industries, Inc. produces a variety of products for direct and OEM companies, the above statements apply only to products as supplied by Hunter Industries, Inc. and may not apply to products with components or treatments added after sale by Hunter Industries, Inc.
We make every effort to source products responsibly. We also want our customers to make informed purchasing decisions including learning more about Proposition 65. For more information about Proposition 65, please visit the California OEHHA Proposition 65 program at www.oehha.ca.gov. Be assured, Hunter Industries, Inc. will continue to monitor the Proposition 65 regulations for any new chemicals. Hunter Industries, Inc. will compare any newly listed chemicals with the raw materials in our finished products and communicate this information to our customers.